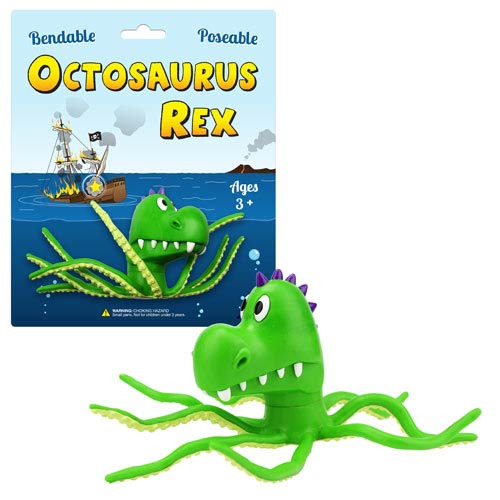 An essential addition to the Off the Wall Toys line, it's the Octosaurus Rex Bendable Figure! Combining the dinosaur to end all dinosaurs, T-Rex, with the coolest ocean-dweller around, the octopus, this Octosaurus figure is a can't miss novelty you're going to love having in your collection. Whether you display him on your desk at work or let him roam the wilderness of your own abode you'll love the inherently fun and unique Octosaurus Rex Bendable Figure! Measures about 3-inches tall. Ages 3 and up.